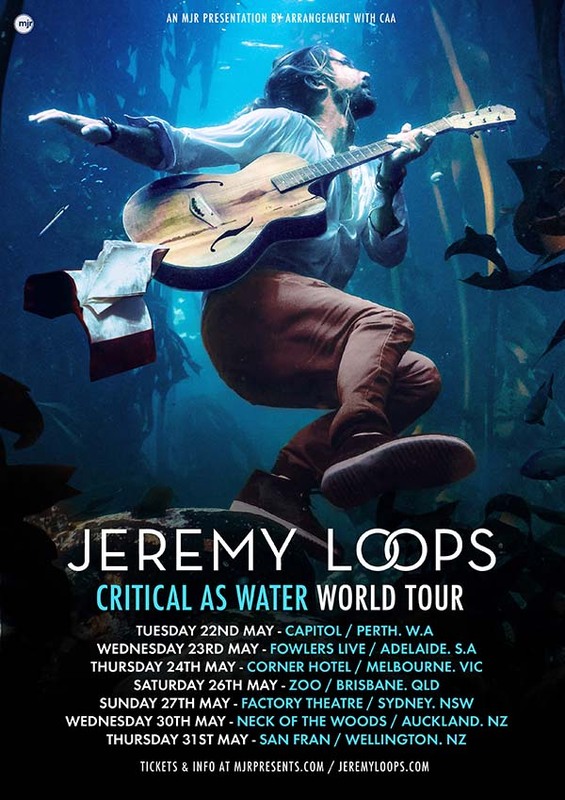 Jeremy Loops has announced his new album, Critical as Water, scheduled for release on Friday 16th March 2018. The follow up to his critically acclaimed debut, which won MTV Africa’s Alternative Album of the Year, and iTunes South Africa’s Album of the Year, is produced by Will Hicks (Ed Sheeran’s Perfect, Lilly Allen, Bastille), with additional production contributions by Jake Gosling (James Bay, The Libertines, Shawn Mendes). Critical as Water is led by the single Waves, a woozy summer anthem that’s garnered over 1 million streams since its recent release. Waves quickly ascended Spotify’s Viral Chart internationally, and made key playlists like Spotify’s Weekly Buzz and Left of Centre playlists. Acclaimed filmmaker Casey Neistat described it as having an ‘incredible music video’, with its visuals filmed in Mozambique where Jeremy is seen surfing crystal clear blue waters alongside whales in a tropical paradise. The theme of water runs deep through the album. Where Waves is breezy and light, Underwater Blues speaks to the weightlessness of insomnia in a hyper-connected always-on world, rewarded only by the release of sleep - a sort of deep submergence. The Shore, closer to a crash on the rocks than a docking in the harbour, speaks to social tensions of the times we live in, where failure to act and resist will sink us all. More urgent still is the real water crisis in Cape Town, South Africa, Jeremy’s home town. On course to be the first major city in the world to run out of water, taps to homes will be turned off on 22nd April 2018, in an environmental crisis that sees the devastating effects of political mismanagement, unsustainable consumption, and rapidly changing climates coming to a head. And so when these themes come up on songs like Flash Floods and a hauntingly beautiful ballad called Vultures, a more terrifying or apt backdrop to the album’s release cannot be conceived. Jeremy Loops is a musician from Cape Town. He is also the co-founder of Greenpop, a tree-planting organisation that’s planted over 85,000 trees in Southern Africa since its inception. His debut album launched at No. 1 in his native South Africa, winning several awards along the way including MTV Africa’s Alternative Album of the Year and iTunes South Africa’s Album of the Year. With his place as one of South Africa’s biggest artists firmly established, he leant on the power of his live show to break into Europe and North America, opening for Twenty One Pilots on the European leg of their Blurry Face Tour. Relentless touring garnered him a cult following in Europe like that in South Africa, and he soon headlined a sold out 30,000 ticket tour of his own across the United Kingdom and Europe. Trading Change has since had over 50 million track streams. In Critical as Water, he looks to translate this cult following in Europe and Africa into a global movement. Jeremy Loops will return to Australia for the first time since his 2016 sold out national tour, playing shows in all major capital cities.